This summer we returned as a family to Arches National Park to celebrate Adam’s graduation and his 18th birthday, one of his favorite places on earth. Scattered throughout the park are 2,000 documented arches, the densest concentration of natural arches in the world. Most of the arches are made from red sandstone deposited 150 million years ago. 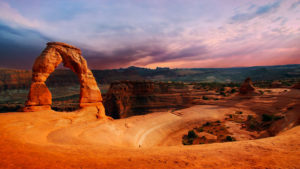 The native people who inhabited these lands viewed the arches as sacred, holy places where heaven and earth co-mingled. When you make the trek through the searing afternoon heat to Delicate Arch and watch the sun go down, you can understand why. It’s truly breathtaking to see this beautiful shape rising up out of the surrounding landscape, lit up by the evening sun. Its even more breathtaking to remember we had no part in the process of its formation. Giant subterranean salt deposits, liquified under pressure, caused the layers of rock above the salt to buckle upwards. Over millions of years, sun, wind, and water eroded tiny particles of rock away, breaking up and removing what was unstable until only the arched ribbon of red sandstone remained. Erosion – the infinitely slow transformation of ordinary matter into holy ground. I am doing a 30 day sketching exercise. Each day, I get a word. And each day, I make a sketch of something that relates to that word. Yesterday’s word was “SLOW”. I drew the Delicate Arch. As I drew, I began to think of our lives as undergoing a similar process to this arch. I began to see how forces in one’s life, often resisted for their harshness, have the potential to slowly work away at our false selves. Eroding us, in a certain sense. At the same time, this process of erosion of our false selves leaves behind the arc of our true selves. I think about Donelda’s story which she shared on Sunday. I see mirrored in her story this same process of transformation. Her life was subject to such fierce elements, and yet what remains behind and within her is this beautiful, delicate arch…so strong yet so kind. Her life has become a sacred place, the co-mingling of heaven and earth. Perhaps this too is a revelation of Divine Love – this infinitely slow transforming of our dusty matter into holy ground. Please pray for the Faw’s as Crista’s mom enters hospice. Prayers for Chris and Anne Hartnell as Chris recovers from a set-back with his health. Prayers for Loree’s Sister Bev, husband Steve and daughter Jackeeann as Bev is in the final stages of a cancer that has taken over her entire body, Steve has Parkinson’s and their daughter Jackeeann is in the hospital in Vernon waiting to be transferred to Vancouver for surgery on a large mass in her abdomen. Please pray for peace as Bev is struggling knowing her daughter is going through an equally difficult time and she cannot be there to support her. Sunday, September 9th: Kick-Off Sunday!